Stonehenge is not a unique structure within Great Britain, more than 900 stone circles have been located in the British Isles; however Stonehenge is the largest and most well-known. Whilst it is not fully understood how and why this henge was important for ancient people, it is obvious that the site was relevant and for thousands of years it was built, modified, utilised and honoured. Stonehenge is an enigmatic prehistoric monument located on a chalky plain north of the modern day city of Salisbury, England. It was started 5,000 years ago and modified by ancient Britons over a period of 1,000 years. Its purpose continues to be a mystery. The henge stones appear to mark and accentuate important stages of the year such as the passing of seasons and particular sunrises and sunsets. This has led many experts to surmise the site was a religious or spiritual landmark used as an astrological observatory. It is believed that Stonehenge also sits proudly on the most prominent Ley line in Britain. Although construction of Stonehenge began about 5,000 years ago, the area appears to have been of symbolic importance for a much longer period of time. 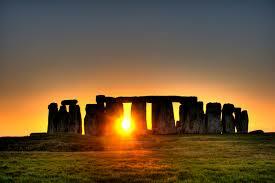 Throughout English history people have promoted differing theories as to who constructed Stonehenge. These range from the magician Merlin, through to Celtic Druids and local shepherds and even alien visitors! As early as 10,500 years ago three large pine posts, which were totem poles of sorts, were erected at the site. Then around 5,500 years ago two earthworks known as Cursus monuments were erected, the longest of which ran for 1.8 miles (3 km). The purpose of these structures is unknown.